<looking poorly is not the same thing as "still having a parasite">. Heaven Bound Celestial Eye (continued) <Hi, MikeD filing in here> Thanks very much for your prompt reply Chuck...but the problems with my celestial have increased overnight. You can refer to my previous email, but here's an update of the last 24 hours: 1. his water temperature drops quite low during the cold nights - I'd say less than 18C (64F), so I have kept him in a slightly warmer room, and put towels around his bowl at night to keep heat in. I don't cover the top though - should I?<Although rapid drops and increases in temperature are taxing on many fish, less so with goldfish, actually a cooler water fish that is often stressed by higher temperatures> 2. His tail rot appears to have stabilized, BUT it is not any better, and the frayed edges have whitish spots on them.<This sounds like a secondary bacterial infection that's apparently resist to the Furnace> 3. I've noticed clustering of small white spots on his tail fins too (the spots appeared about 2 days ago, and have since dramatically multiplied in size and number). I'm guessing this is Ich?<I'd have to say this is a realistic assessment> I have bought some medication containing 37mg/ml formaldehyde + 0.32mg/ml malachite green, but am unsure whether to add it yet as it seems like quite an aggressive treatment, and I don't want to further compromise his immunity.<Ick won't compromise his immunity, but will rather just kill him. Ick's a protozoan parasite that often most severely infects a fish's gills and eyes, and unless treated promptly the die is likely cast> Last night, on the advice of a couple of aquarium stores, I put 2 tsp of rock salt into his bowl (which contains about 5L of water). He has perked up slightly, but still seems quite listless. My major quandary is that I am out of the country for the week from Thursday, and will not be able to constantly monitor him - as a treatment with malachite green/formaldehyde seems to require. Some websites and a vet I spoke to have suggested the increase in salt content to about 2g/L... is this a good idea, or will it mean that the Ich comes back?<The increased salt would be effective only against a fungus attack and will likely stress the goldfish as much as it does the Ick parasites, possibly more> Aalso, In cases like this, would you recommend treating with antibiotics first and then the Ich treatment, or the other way around?<Ick first, antibiotics second. Have you considered that a larger container with a more stable environment would likely eliminate most or all of your difficulties? A 10 liter container would cost less than what you've already spent in medications> Am suffering a bit of information overload here and am a little confused! Thanks heaps for the useful info on your website; you guys do a great job! I feel quite awful as I was given my fish as a gift, and don't want him to die through my inexperience. Sick Goldfish Hello........ Please can you help me..... I have 2 big Veiltails, Both female. One of them is fine, the other one, 1st, she started to clamp her dorsal fin, and now she hangs to the water's surface. She still eats well. When I feed them, she will swim to the bottom to get the food. I have been doing water changes, and I do use a tap conditioner. What else can I do ? Thanks very much < The clamped fins could mean a couple of things. Either a protozoa or bacterial infection. I would try some rid-Ich first for treating Protozoans. It takes at least three days to see if it is working. If you don't see any improvement then I would use Furanace to treat the bacterial infection. Follow the directions carefully and watch for ammonia spikes because these medications will affect the bacteria bed.-Chuck.> Rachel. Fish laying on the bottom all day Hi Wet Web Media crew, I have been and read your useful site in hope of some answers to my fish's mysterious illness. I have a beautiful orange fantail and his name is Quasar. He has been with us for a year, and is living with a red cap in a 26 litre tank (6.85 gallons) We have been doing exactly the same thing all this time - changing water every two weeks, feeding them frozen (then defrosted) brine shrimp in the morning and 2 floating pellets each for dinner. They have also have a plant, which they did not eat in there. Quasar is resting on the bottom of the tank all day, and only comes up for food. His lower tail looks a bit split and stringy, which we suspected is fin rot, though there is no sign of an infection. This behaviour and the tail thing happened on Friday. The aquarium shop said it may be because he is laying on the bottom, and bacteria is able to attack his tail more readily. We have treated him with MelaFix (on Sunday), a tea tree derived 'natural' medicine that helps to cure fin rot, whether it is or not - I'm not convinced. The carbon has been removed whilst treatment is taking place. Our water was tested on the weekend, and everything is fine. A water change has been made and that has tested fine too. The red cap seems unaffected by this, though hovers around his friend to give him support. My fish seem to recognise food time, when I turn off the pump so their food doesn't go everywhere, and the spread is minimal. Quasar then comes up for food,( which I have minimized for him), and swims around hunting for more, then settles back down to rest, when the pump is turned back on (a sign feeding is over). This may be unrelated, but we have noticed his vision seems to have deteriorated over the last month as he seems to miss sea monkeys as they fall almost in front of him, and he seems to be guided by smell to eat them. Short sighted like his owners. He is quite young still, body length 5cm, and he used to be so efficient and sharp. We wonder if he has injured himself, as there is a small brown mole like mark that is seen on the top of his head through his translucent skin. So here are as many facts as possible. Aquarium workers may know some, but I am confused, and their answers are inconclusive. Could he be constipated. We have replaced the plant he doesn't eat with one he does yesterday (Sunday). As you can tell, we love him very very much. Please shed some light on his mystery illness, and give us some hope for his fighting chance. He is strong and healthy when he does swim and the most lovable fish. < You fish sounds like it may have come down with an internal swim bladder infection. 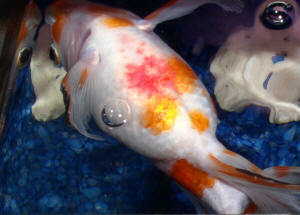 The swim bladder helps the fish keep its buoyancy. When it becomes infected the fish sometimes lose this ability and rest on the bottom as they try and swim around they seem to bump into every thing. They often injure themselves as they move around and get bruised up an torn fins. I would put him in a breeder net for now to minimize the physical damage and treat with Metronidazole for the internal infection. This medication may affect the good bacteria so check for ammonia. Do not feed during the treatment.-Chuck> Please answer soon. Vonda, from Melbourne.